Rescuers pulled two people from the Saugatuck River in Westport after a car plunged into the river Saturday night. One person is dead and a second was taken to the hospital after a car crashed into the Saugatuck River in Westport Saturday. 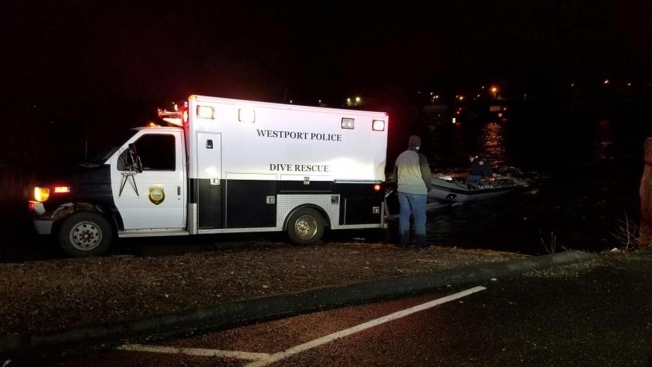 Westport police said that around 7:40 p.m. emergency crews responded to 911 calls that a woman was screaming for help from the river near the Whelk Restaurant at 575 Riverside Avenue. When police and firefighters arrived they found the woman in the middle of the river being pulled with the current. Crews were able to rescue the woman using a civilian boat. She told officers she’d been in a car that crashed into the river and that there was another person with her in the car who may still be in the water. She was taken to Norwalk Hospital for treatment. She has not been identified. Rescuers found the second victim near the Bridge Street Bridge and pulled him from the water. He was transported to Norwalk Hospital where he died of his injuries. He has been identified as Richard Lamendola, 76, of Syosset, NY. Police said no foul play is suspected in the accident and that the Westport Police Department is investigating. The car was found and was removed from the river. Westport firefighters, state police, Norwalk police and Fairfield police all responded to assist with the incident.